Much of the world’s coastlines are deltas, filled with fertile soil and rich ecosystems. As such, they have provided good agriculture, logging and other natural resources for people throughout history. It’s no wonder that 40% of the world’s population live within 100km of the coast. Over time, however, deltas, also called deltaic plains, are at the whim of the rivers that make them. Like most natural things, we imagine the deltas on which we live to be permanent. That, however, is not the delta’s way; they will grow and shrink as the tract of the river shifts and moves, or as conditions are altered upriver. 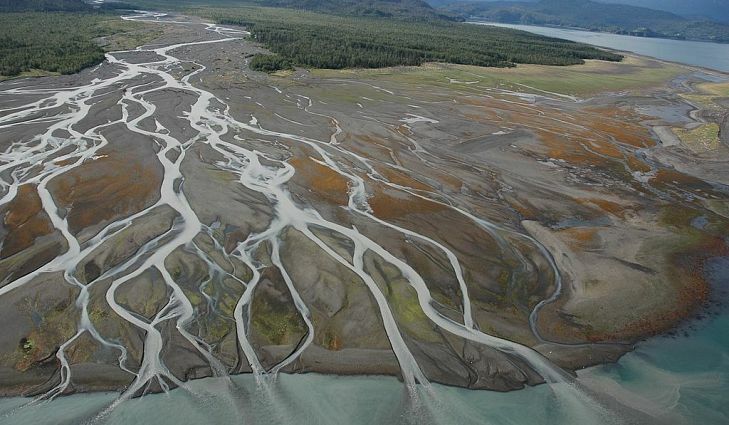 Deltaic plains encompass many different habitats, including forested wetlands and salt marshes. All of these rely heavily on sediment and nutrients from the river to fight wetland loss, which is a huge problem in deltas around the world. For many deltaic plains, gains and losses of area are driven by two factors: the balance of sediment availability, and how efficiently the land will catch that sediment. Intuition would tell us that a river depositing high loads of sand or silt would build a large delta, and generally, that does seem to be the case. However, few people have actually calculated this relationship or observed it over a long time. This is where Louisiana State University Boyd Professor Dr. Eugene Turner stepped in, with a study of the Mississippi River Delta (MRD). Turner digitized old maps of the MRD to measure the size of the delta from 1838 to 2002, taking the calculated areas and comparing them to historical and current sediment load data from the river. With this information, Turner was able to tell the story of the MRD as it was colonized in the 1800s up to the wetland loss crisis occurring today. Before the 1850s, the population in the Midwest was fairly small, so the upstream reaches of the Mississippi watershed were generally unimpacted by humans. Moderate amounts of sediment were carried by the river, creating a modestly sized delta at the mouth. Population and agriculture increased in the watershed in the 1800s as European settlers moved to this fertile land. Intense agriculture disturbed the soil structure and caused a watershed-wide erosion crisis. Much of the good farming soil was washed into the river and down to the coastline of the Gulf of Mexico. By the 1870s, the amount of suspended sediment in the Mississippi at New Orleans was two times greater than before colonization. The sand and silt were deposited in the MRD over time, and by 1932, created the greatest extent of the delta, fashioning the huge amount of wetlands we are familiar with today. According to some studies, the area in the bird’s foot delta, the southern-most tip, has almost doubled from before European colonizers arrived. In the Mississippi River Delta (MRD), the relationship between sediment and land building has come to a head during the past 90 years of accelerating wetland loss. Currently, Louisiana has approximately 29 square miles of wetlands that disappear every year, constituting 80% of the nation’s wetland loss. Wetland loss is driven by damming and water management upstream in the Mississippi; as a result of these processes, the amount of sediment reaching the Gulf of Mexico has been cut by half. That material will not be deposited on the land, land that relies on influxes of sediment to combat rising sea level and subsidence. In fact, according to Dr. Turner’s maps, the delta is just about the same size today as it was back before the watershed was colonized. So, is there enough dirt in the river? Restoration activities in the modern delta intend to reconnect some parts of the deltaic plain to the sediment in the river. The problem with these management plans is that they are trying to recover an area of the delta that was only possible to build due to the incredibly large amounts of sediment present in the river during the erosion crisis of the late 1800s. Although there does not seem to be enough sediment in the Mississippi river system to build the delta back to its former “glory”, there are ways that watershed managers can introduce the maximum amount of sand and silt possible in order to maintain the current delta size and prevent more people from losing their livelihoods and homes. One example are large scale sediment diversions currently being built across Louisiana today. Estimations by experts found that colonization has led to reduction of global sediment loads reaching the world’s oceans by 10%. Research tells us that our coastlines, however, are dynamic systems that can find balance even in the most extreme conditions. For more information, follow Alina Spera on twitter! I am a second year master's student at Louisiana State University studying wetland biogeochemistry and coastal restoration. My thesis work involves a geostatistical analysis of wetland soil and how large scale restoration projects may impact it. When I'm not in the field or lab I'm probably playing roller derby or hanging with my hamster!